Concrete Renovations Ltd offers the service of structural strengthening using resin bonded carbon fibre plates. 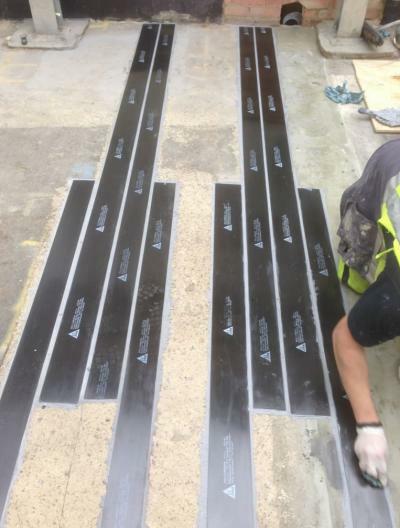 These carbon fibre plates are being installed by Concrete Renovations Ltd at Cambridge University’s Arup Building at the new museum site. In this case the concrete being strengthened is cantilevered requiring the plates to be placed on the top surface of the slab using epoxy resin adhesive. Recent developments in material technology have seen the introduction of carbon fibre plates, which are significantly lighter and easier to install than steel plates of similar capacity. Carbon fibre fabric is now also used to strengthen columns and beams using a wrapping technique. Single or multiple layers of uni or bi-directional fabric are impregnated with resin adhesive and applied to sections such as beams and columns to improve strength. Since the late 1980’s there has been a lot of pioneering work in many research and testing facilities around the world, that resulted in huge advances in structural strengthening techniques, particularly with composite carbon fibre reinforced plastic (CFRP) extruded plate and woven fabric systems. The bonded CFRP systems used by Concrete Renovations Ltd are specifically designed for use as ultra-lightweight but extremely high strength and durable external reinforcement, which is bonded to the structure with high performance epoxy resin adhesives. This plate bonding system is also totally corrosion resistant and provides a long term maintenance-free solution, yet it is often incredibly cost effective versus traditional steel or additional reinforced concrete strengthening and rebuilding options for the owner. The pre-formed extruded CFRP plates with precisely defined properties are externally bonded to the prepared concrete surfaces of the structure, at locations determined by the responsible Structural Engineer. The woven CFRP fabrics allow an almost unlimited range of shapes including round columns, curved sections and any size of element to be strengthened. The CFRP fabrics are effectively laminated together as required around the shape of the structure on site, with the same epoxy resin adhesive that also bonds them to the structure. There are also other fabrics that can be used for certain special strengthening application including Aramid and Glass Fibre Fabrics. Plate Bonding always has a very detailed structural engineering input requirement and responsibilities. 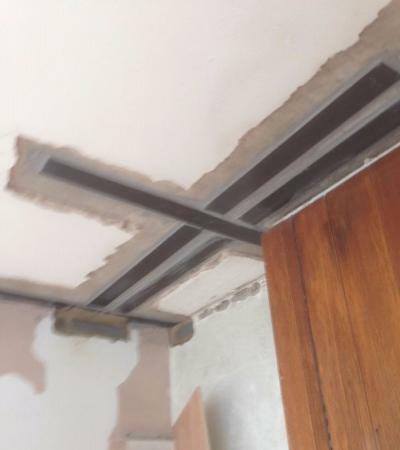 Therefore the involvement of an experienced Structural Engineer is always essential, and an experienced Specialist Contractor such as Concrete Renovations Ltd is recommended to do the work. The technique is used to provide additional resistance to bending, improve load capacity or reduce deflections, and is particularly useful as a retrospective method when changes in use in a building, or perhaps increased vehicle loadings on a bridge structure need to be addressed or bursting or impact resistance for columns on bridge structures. Concrete Renovations Ltd installed over 500metres of Sika Carbodur Carbon Fibre structural strengthening to the Cripps building at Cambridge University. The photograph shows how the plates were adhered to the concrete soffit to offer structural strengthening. Holes were cut through the walls of the rooms to allow the plates to be positioned correctly.